Food Security in the Developing World provides an entry point into the complex and challenging subject of providing access to nutritious and safe food in a readable format, capturing the essence of the subject in an effective and impactful manner. Organized into nine chapters the book covers the manifestation and measurement of food insecurity; means whereby households endeavour to be food-secure; causes of food insecurity; mitigation of current food insecurity and prevention of future food insecurity. There will then follow a chapter with case studies, a chapter on cross-cutting issues and the final chapter drawing conclusions and recommendations on the way forward to increase the prevalence of food security in developing countries. A glossary and Bibliography will round off the book. 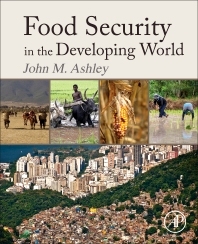 Dr. Ashley’s real-world experience makes the book accessible while providing valuable insights into the broad range of factors that contribute to food insecurity in this large at-risk population, and practical means of addressing them. John Ashley graduated in botany from London University, and then applied that knowledge to the field of agriculture for his doctorate from that University, working with the groundnut crop in Uganda. He also holds a degree in psychology from Cambridge. Dr Ashley has engaged in projects which have sought to help governments address current food insecurity, and increase resilience against future food insecurity. He has multi-sector program experience in agriculture and forestry, rural development, water, environment, education, nutrition and social transfers, roads and local government. He has worked in some thirty vulnerable and/or conflict-prone countries for 40 years, especially in Africa and Asia. He was with FAO for five years, and then became an adviser to national governments in interventions funded by international banks or donor agencies. He has conducted research with grain legume and cereal improvement programs in Libya, Kenya, Uganda and Nepal, and taught agronomy, crop physiology, ecology and human nutrition at Makerere University, Uganda.